To mark Valentine’s Day as a special occasion we always make sure we seek out a really special food and wine experience. Last year, we found just that at Mezzalira, on London Circuit, part of the Trimboli Brothers growing stable of fine food outlets which includes Italian & Sons and other soon to arrive ventures in the burgeoning food precinct of Braddon. Pulp Kitchen Valentine’s Day degustation special. Daniel Giordani and team have really made Pulp Kitchen into something special. It rarely disappoints and always surprises. Chef Keaton McDonnell is inventive, turning out a range of complex and attractive dishes that balance sweet and savoury perfectly. You might raise your eyebrows as you contemplate the latest dish to land in front of you, but you are left licking your lips and singing its praises as the clean plate is whisked away. The evening began with a glass of The Duchess sparkling cuvee, a pleasant NV from the Hunter Valley, and with an appropriately appetite stimulating crusty Italian style bread with a delicious and subtle lemon and fennel butter. This was followed at a respectful distance by succulent Sydney rock oysters with a brisk and refreshing champagne granita. We’re not usually overly attracted to such a combination of seafood and sweetness, but it just worked and you were left slightly challenged but undeniably better for the tasting experience. Before the next course, we started on a 2007 Burgundy from Nuits-St Georges, and this fine expression of pinot noir, with its lively fruit and fine but firm tannins, proved a perfect foil for the dishes to come. The next of these was, in my view, the pick of the night. The menu calls it Duck Liver Parfait with pickled plums and fine slivers of rye toast, but mousse would be a better description of this light, buttery, creamy quenelle. Balanced by the cut-though acidity of the pickled plum, our taste buds were feeling pretty smug and self-satisfied at this point in the proceedings, and rightly so! 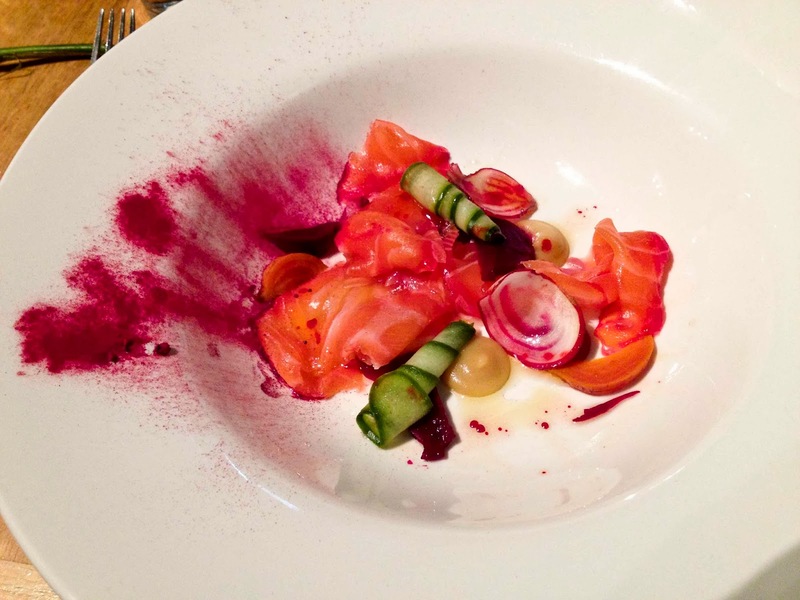 The next course, a beautifully presented Beetroot Cured Salmon, served with roasted beetroot and pickled cucumber. This was a delicate and refreshing appetizer with enough zing to get the juices flowing. Next was a pick between fish or beef for the next course, I chose the pan fried south Coast gurnard fillets (a fish I hadn’t heard of before) accompanied by green olive risotto and braised mussels. 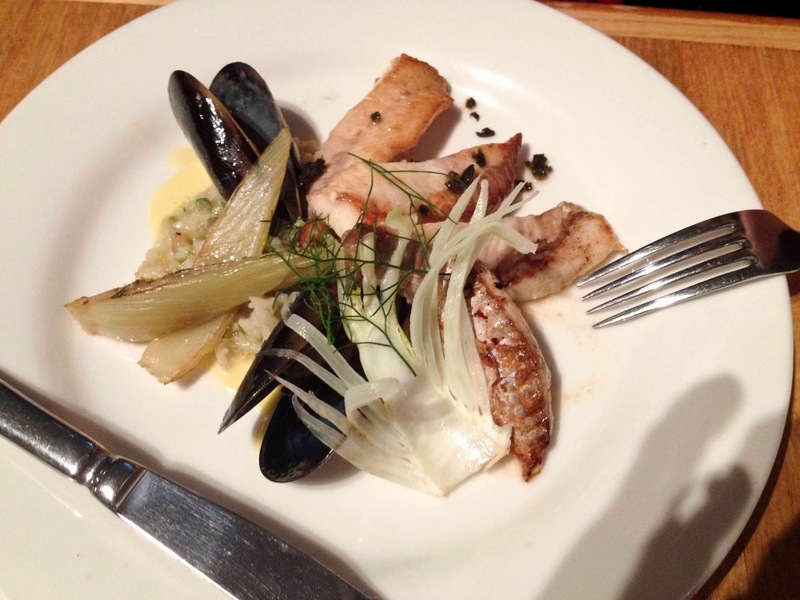 The small buttery fillets of fish had a strong and assertive flavour that proved a good match to the brothy mussels and back flavours of the just al dente risotto. Steve opted for the duo of beef - delightful small portions of fillet and rib, served with carrot and blue cheese puree with baby roast onions. 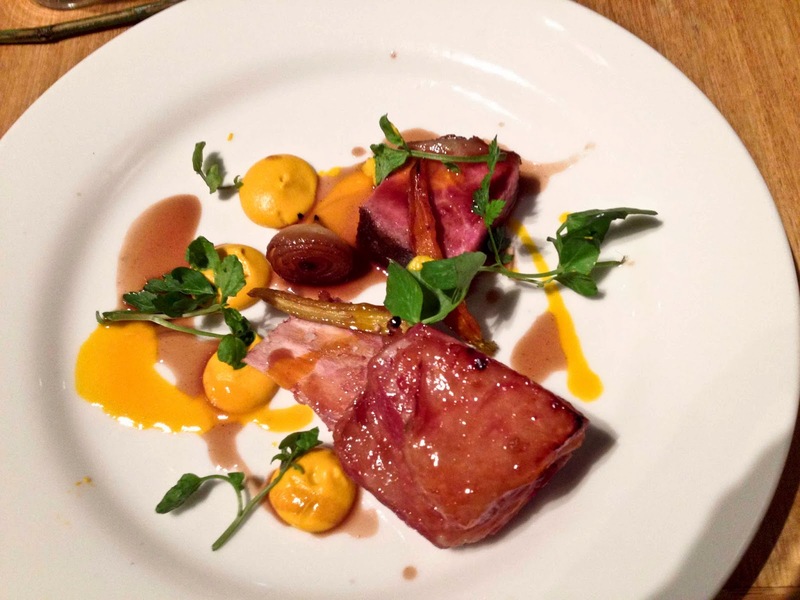 This was a beautifully conceived and executed dish, with the two cuts of beef prepared in a way which accentuated subtly the difference in taste and texture and balanced beautifully by the sweet and savoury accompaniments of puree, jus and veggies. Yummmm. The European farm house cheeses which followed were modestly proportioned, a great thing at this stage in the proceedings, but packed with flavour. The brie and ashed goat’s cheese delightful, but the nutty, intense aged Dutch cheese was the hero. Served with a deliciously fried herbed flat bread, it perfectly rounded out the pre-dessert selection of the degustation. Although there was a Dark Chocolate Terrine with Hazelnut Cremeux and Bitter Orange Gel on offer, we both opted for the Vanilla and Yoghurt Panna Cotta with Poached Strawberries and Meringue. I guess I’m just not a jaffa fan. 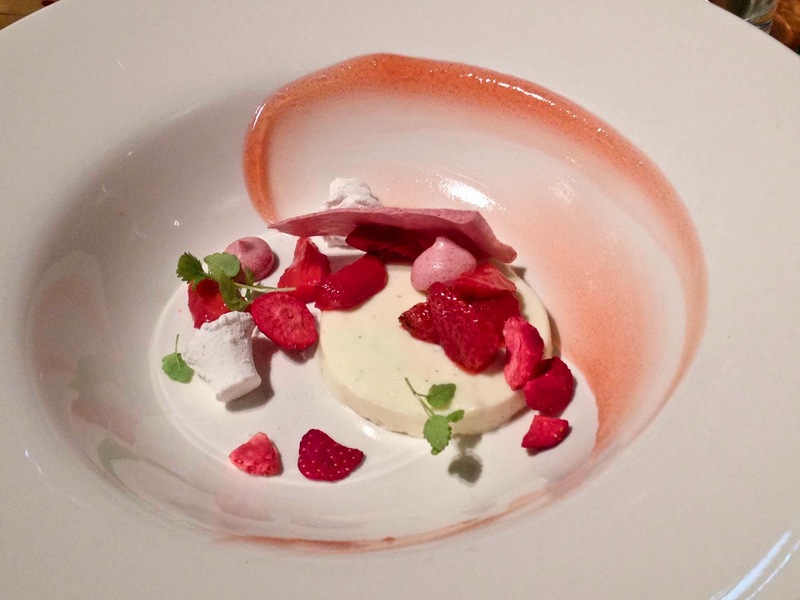 Again, we were rewarded with gorgeous presentation and didn’t disappoint with its rosy, comforting creaminess balanced by the sherbet sharpness of the dried and poached strawberries and the dry, crisp meringue shards. 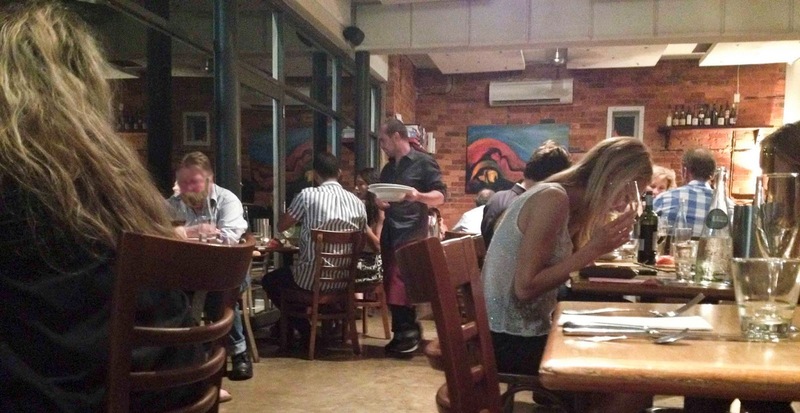 The other important aspect of any restaurant is, of course, the service. While we watched with respect the military precision of the crew delivering a six course degustation to a packed room, the balance of casual friendliness and attentiveness of the staff was never compromised. It was clear to us that all staff were keenly interested in what we thought of the food, and that is a long way from the smugness and hauteur that you sometimes get in restaurants who manage to convey a sense that customers are a regrettable but necessary inconvenience. Daniel is constantly circulating, having a friendly word here and there, delivering a dish or occasionally clearing away, but watching to make sure all is running smoothly. His friendly presence, the attentiveness of the rest of the crew and the superb food, made this a truly memorable experience. We believe that further degustations – one game-themed and another in truffle season - are planned for later in the year. We’ll be there! Reliving travel experiences through food is a satisfying way to keep the memories and travel bug alive. So when our companions from a recent trip ask us to a Spanish themed lunch, I cast my mind back to our shared visit to Spain. Spanish desserts reflect its Islamic history, dominated by the tastes of North Africa, with almonds, honey, syrupy sugar, with fresh and dried fruits. Alongside this, there’s a strong representation of custard based sweets, often infused with the ubiquitous orange. With orange trees planted in most home courtyards and a popular street tree, it’s little wonder that these juicy golden globes are a Spanish favourite. The Panchineta, a traditional Basque dessert of Islamic origin, is a custard based pastry cream pie which bewitched both my tastebuds and my weight while we were in Barcelona, so it seemed only right that I revive this experience for our lunch party. Although this dessert appears complicated, it’s very simple and elegant and can be served warm or cold. In terms of timing, the pastry cream should be made first, preferably the day before and refrigerated overnight. The pie is best served on the day it’s made. I tweaked the traditional and original recipe a little by adding slightly more cornflour and I baked it in a glass pie dish rather than straight onto a baking sheet. This was more to avoid the custard from running out of the pie and messing up my clean oven. I served this with an orange ice cream made with sour cream to offset the richness of the tart. Whisk together the ground almonds and the sugar in an electric mixer until they form a paste. Add the butter and continue beating about five minutes. Add the egg yolks, one by one, mixing until combined. Add the cornflour and mix well for thirty seconds. Add a little of the milk to the mixture while mixer is off to loosen the mix, then whisk together on a low setting, adding the remainder of the milk slowly. Pour the custard mixture into a large heavy based saucepan over a medium heat, adding in the cinnamon stick and orange peel. Mix constantly with a hand whisk to keep the custard moving over the heat and to stop it sticking and forming lumps. It should cook to a thick custard consistency. Remove from the heat immediately and pour into a dish and cover with plastic wrap. Refrigerate for a minimum of three hours or overnight. When the custard is cooled remove from the fridge. Fish out the cinnamon stick and orange peel and discard. Prepare the pastry. On a floured benchtop roll out the puff pastry sheets, so they are slightly larger, to fit the base and top of a greased, twenty-four centimetre round pie dish. Place the rolled base pastry sheet into the dish, pressing to fit. Trim the edges with a sharp knife leaving an extra small margin to allow for shrinkage. Paint around the edges of the pastry base with the egg and milk wash so the top pastry sheet will stick to it. Spoon the custard evenly onto the pastry base and place the remaining pastry sheet over the custard, pushing down on the edges to stick to the bottom pastry sheet. Trim the edges of the top sheet. Using a fork, crimp down the edges of the pastry all the way around the top. Make a few slits in the top of the pastry to allow the steam to escape. 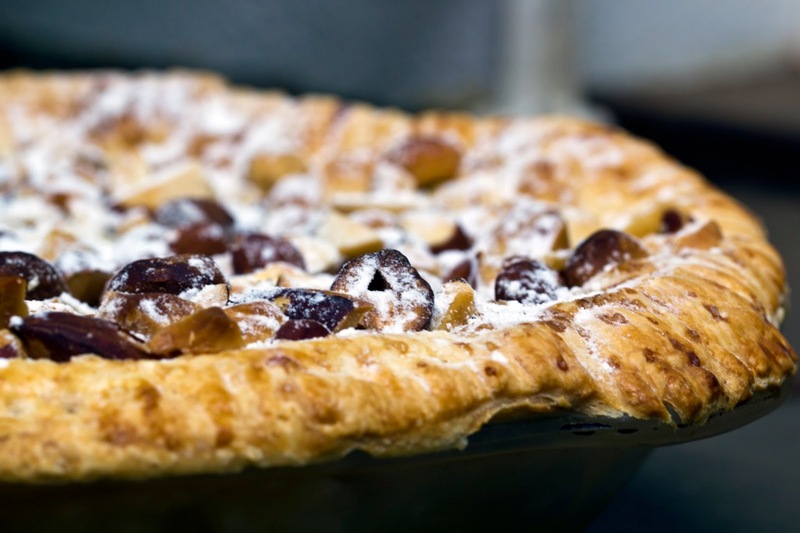 Paint the top of the pie with the remaining egg and milk wash and sprinkle the top heavily with the chopped mixed nuts and raw sugar. Bake for twenty to twenty-five minutes until golden, checking the pie does not burn. Remove from the oven and leave to rest for half an hour before slicing. Dust liberally with icing sugar. The Panchineta goes down well with some tart orange ice cream and a small glass of Pedro Ximenez Sherry. With eggplant season just around the corner, try this sneaky recipe, especially for those people with a loathing towards this humble veg. 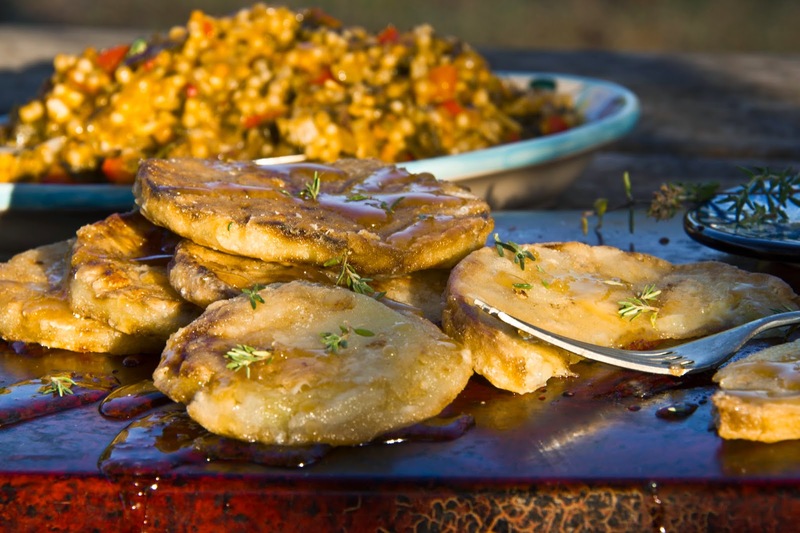 The Berenjenas Fritas Con Miel, a Spanish Tapa found throughout the south of Spain, turns this ordinary vegetable into succulent comfort food. Peel the eggplant and slice into half centimetre width rounds. Place the eggplant slices into an airtight container and top with milk until covered. Cover and refrigerate overnight or for a few hours. In a shallow bowl, mix the flour with one teaspoon of salt. Heat two tablespoons of olive oil in a medium frypan over medium to high heat. Line a plate with paper towel. When the oil is hot, dredge the eggplant slices in flour and tap off the excess. Gently place a few slices at the time in the frypan, cooking for about two to three minutes per side or until golden. Remove and place on the paper towel to drain. Repeat with the remaining slices of eggplant, adding more oil to the frypan as needed. Sprinkle the eggplant with a little sea salt and cracked pepper, then drizzle with honey and sprinkle with thyme. This can be served as tapas, a dessert or as a side dish to a main meal. The heat is on, so fire up the barbeque, get the picnic rug out and throw those ribs on the grill. We’ve had a fairly abstemious Christmas this year, in terms of our chocolate indulgence, so in order to keep the levels up, I turn to rubbing my meat in it. This newfound fascination I have for pork and chocolate really is very seductive and moreish, and the two make a heavenly match. The preparation is a touchy feely process of rubbing the spice mixture in, so be prepared to get down and dirty with your ribs. I’m fascinated by the Mexican mole influence of bitter chocolate used in savoury dishes. With the addition of some basic cupboard spices, the ribs turn from mediocre, to tender, melt in the mouth perfection. After trying a number of different chocolate and spice marinade combinations, I settle on vanilla, spice and a hint of chilli. If you are a real chocoholic and you want the big flavour, try marinating your ribs in the chocolate rub for 48 hours in the refrigerator. I used Rich Dark Pure Dutch Cocoa that can be bought from Essential Ingredient. Mix all of the ingredients except the ribs together in a bowl. With clean hands rub the ribs generously with the spice mixture. If you prefer you can add a little olive oil to the mix to make it stick to the ribs. Wrap in plastic wrap and refrigerate at least overnight. Remove the ribs from the refrigerator about an hour prior to cooking, this will allow them to cook quicker and reduce burning the outside. Using a hooded barbeque, place ribs over a medium heat grill plate, close hood and roast for about thirty minutes. Open lid and increase temperature of barbeque and roast for about another ten minutes. Watch that they don’t burn. Remove ribs from heat and leave to rest for ten minutes. If cooking the ribs in an oven, preheat the oven to 180C and place ribs in a shallow baking pan, cooking for about 25 minutes. Remove from the oven. Increase the oven temperature to 200C and return ribs to a wire rack over a baking tray. Bake for an additional ten minutes or until the ribs are browned. 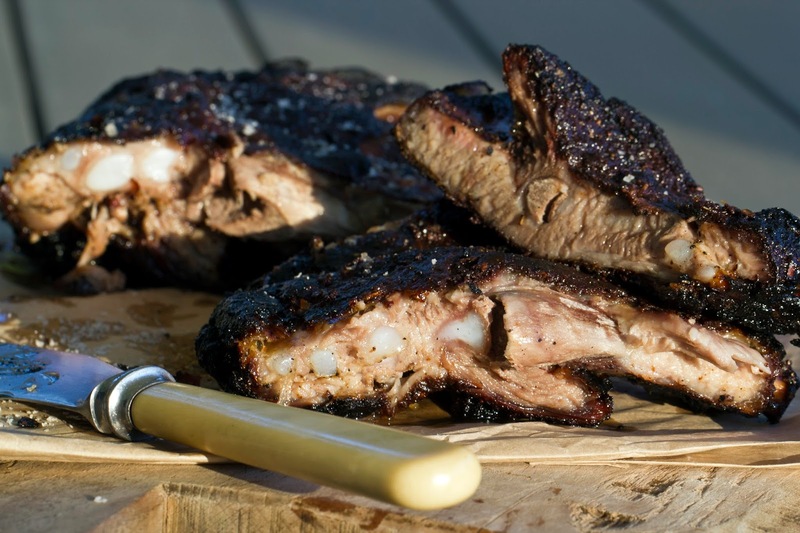 To serve, cut ribs into individual bones and serve with a salad.